It is believed that there are anywhere between 2,000 and 10,000 saints in the world. (According to the Catholic Church, a “saint” is anyone who is in Heaven.) But of these saints, only some are remembered and celebrated, while others have fallen by the wayside along the course of history. Santa Muerte, or the Saint of Death, is a Mexican saint that is representative of death and dying and serves as a figure much like the ancient Greek Hades, the god of the Underworld, and has a long and rich history as an entity of religious significance, dating back to long before the Spanish conquests of North and Central America. Various cultures have sought to personify death in different ways, from the Danse Macabre of the Middle Ages, to the Day of the Dead of modern-day Mexico and other areas within the Americas. Death has been given many faces, in many different ways. Here are ten facts about Santa Muerte, the Saint of Death, one of the most fascinating death symbols that humankind has ever believed in. 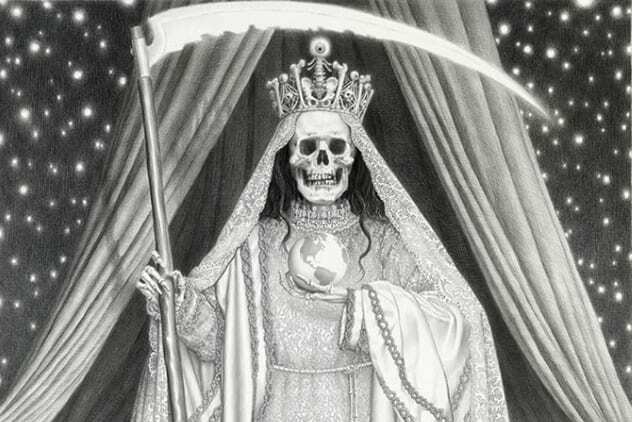 Santa Muerte, though technically a goddess-like figure, bears a striking resemblance to the European Grim Reaper. Most often portrayed as as skeleton cloaked in black, this figure often carries a scythe and, sometimes, a globe or a scale. The figure also carries all of the hallmarks of the death art motif, the Danse Macabre, which was the medieval European embodiment and personification of death, through art, music, dance, and various figures throughout time. When Europe faced the plagues which ripped through the various nations at the time, the Danse Macabre served as an embrace of the equalizing factor of death, and the universality of death. 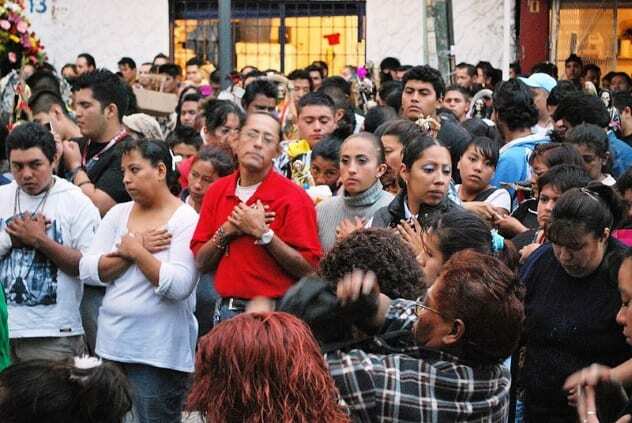 So, too, does Santa Muerte in Mexican culture and its neighbors who celebrate it. In a very real way, believers in Santa Muerte as a figure in their lives, a saint or goddess to be followed, subscribe to the idea that death is the ultimate equalizer: It doesn’t matter if you’re rich or poor, good or evil, kind or downright malevolent; someday, at some time, death, in this case personified death, comes for us all. This great equalization has earned Santa Muerte quite a following from all types, across a broad spectrum of people, from the most socially conservative to the highly progressive crowds who feel shunned by the Catholic Church or the state governments under which they reside, and across almost all general socioeconomic boundaries. These words are some of the roots of the modern rendition and fusion that would become Santa Muerte, tracing to a time long gone and reflections on death and mortality that took place way before our own lives began. 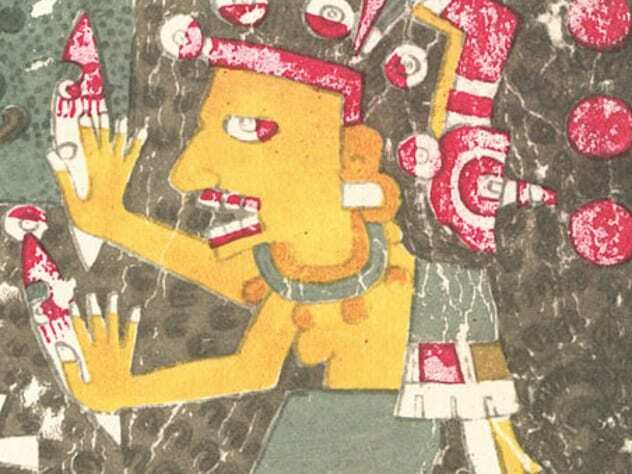 But long before even these words were etched, the Aztecs were worshiping a goddess of death named Mictecacihuatl in a celebration much like today’s Mexican holiday Dia de los Muertos, or Day of the Dead. After the Spanish arrived in Mexico and began the conversion of the natives to Catholicism, the holiday shifted in the calendar to coincide with the Roman Catholic All Saint’s Day, and the two were forever fused in Latin American culture. Celebrations of Santa Muerte take on various forms depending on the region and are pretty widespread. Much like the Aztecs did originally, today Santa Muerte and Dia de los Muertos are celebrated with food and dance, songs and wine, alcoholic beverages, and costumes, all of this bearing a dark, morbid theme, where the practitioners embrace the nature of death, not as a terminal finality but as a transition from one plane of existence to the next. Those who celebrate not only grieve and use this time to signify loss but also to rejoice in their lost friends and loved ones passing on to what they believe is another spiritual plane. It is also a time for them to reflect on their own mortality and the nature of existence itself. What happens when we die? This has been a question humankind has faced since time immemorial, and those who believe in Santa Muerte as a figure to be followed, rather than shyed away from, would rather take these sorts of questions head-on instead of running from them or tucking them back into the obscure, dark passages of the mind, out of sight. During such Day of the Dead celebrations, as well as other times throughout the year, followers of Santa Muerte set up places of worship and shrines dedicated to the Lady, where they seek and find solace and comfort from their beliefs. Unlike the European Grim Reaper, this goddess is loved and revered, much like Hades, as one who ushers us into a better, spiritual world. 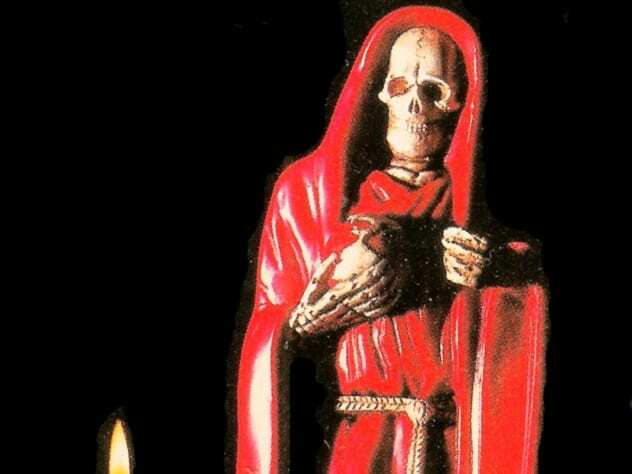 Alcohol, incense, candy, and other delightful foods are consumed in worship of Santa Muerte, Our Lady of Holy Death. Santa Muerte figures come wearing robes in various colors for different purposes during prayer, as it is believed that this goddess can grant favors and actualize what a practitioner wants to see manifested in reality. White robes are a symbol to signify or ask for purity, red robes represent either passion or love, and green robes represent justice. There are also amber robes for health and black robes for protection. make him restless so that he will always think of me. So, this goddess of death, this saint of the dead, began also as a figure who would terrify a person into loving someone who sensed a bit of unrequited love or simply wanted the person so badly that they would do anything to possess them. There are many, many other prayers which are said to increase the chances of finding success in love through this deity, and one can imagine that they will only become more abundant with time. Sadly, good things can only go so far before they become hijacked by people and perverted in their intentions. 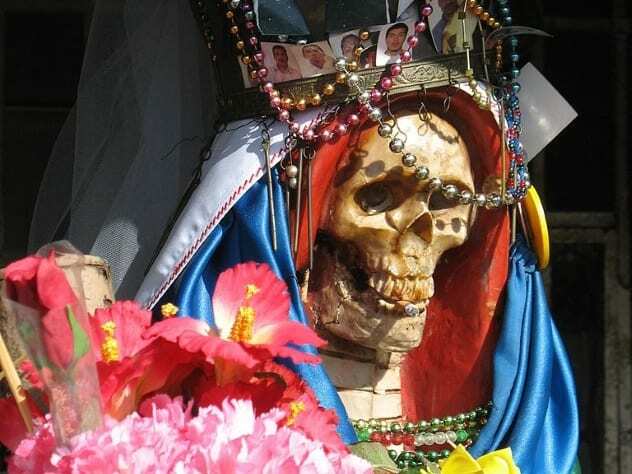 This is the case with Santa Muerte, who, for better or for worse, has also become a hit among Latin American criminals as well as street and prison gangs. It doesn’t take much reflection to see why, with the general overarching narrative of darkness and death, Santa Muerte’s imagery is almost designed for both intimidation and fearlessness, even though that’s not the original religious significance at all. Ritualistic gang killings have been performed in this deity’s name, as people have sought to infuse religious culture with criminal or gang culture. As such, Santa Muerte has found herself on the front lines of cartel drug wars. 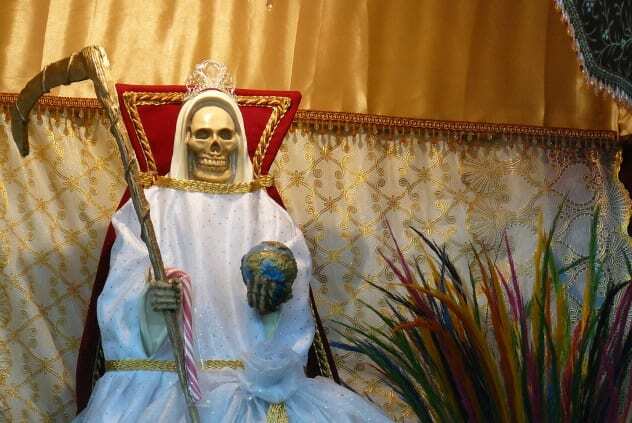 Further tarnishing the name of this interesting figure are reactionary, fearmongering campaigns in the West, where warnings abound about the “dangers” of Santa Muerte as a cult to undermine the church, the state, or society at large. Fortunately, sane and moderate journalists and individuals see this practice for what it is, a tradition and expression of the human existence, with a rich cultural heritage spanning thousands of years, not a manifestation of Satanism. Some sources have actually begun to trace the lineage of Santa Muerte to death rituals carried out up to 100,000 years ago, a clear indication that humans are doing what humans have always done, honoring their dead with mass graves and intricate burial practices and thinking about their mortality. For those in modern times who’ve been pushed aside, ostracized, or marginalized, Santa Muerte has also provided a place of refuge, for minorities, women, the LGBTQ community, and other groups which have found themselves bearing the brunt of hatred or violence. This saint, or goddess, depending on how you want to view her, has been a guide, an aide for many in overcoming adversity in times of strife and personal challenge. The disenfranchised often find comfort and a place of refuge in the belief in this saint and her ability to help guide them, help them make decisions to better their lives, and help them to fend off people who wish them harm. How interesting it is that a figure worshiped for so long, thousands upon thousands of years, has turned into such a progressive icon for so many people. Despite attempts to smite this saint and related festivals out of existence, there has been a large surge in popularity for both Santa Muerte and Dia de los Muertos events, starting in Mexico and spreading to Los Angeles and then the rest of the United States. 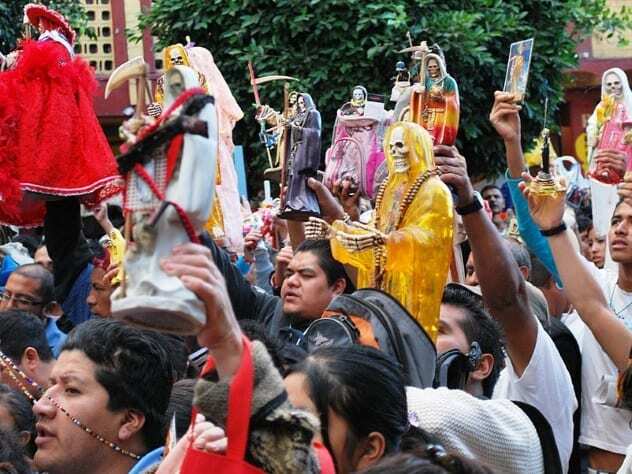 These dark events and the dark, shadowy figure of Santa Muerte have been growing rapidly, with festivals and parades springing up at such a rate that even the Vatican is concerned. But this dark aspect of humankind’s expression isn’t anything to be afraid of; for many, it’s just good fun, and for others, it’s a source from which they draw inspiration and healing. Santa Muerte is actually one of the fastest-growing religious figures in the United States, and festivals in her honor are plentiful, as individuals and families seek fun and thoughtful reflection upon our mortal coil. I like to write about dark stuff, philosophy, history, true crime, and death. Read more wild facts about saints on 10 Eerie Saints Worthy Of A Halloween Celebration and 10 Incredibly Gross Stories About Beloved Saints.